Look no further for an affordable refurbished Aura StarPulse Laser by Laserscope. SunrayLaser.com has the equipment for you in stock. The Aura StarPulse technology has won acclaim for its power and versatility to treat a variety of cosmetic conditions. Used Laserscope equipment might be the most cost-effective solution to your practice’s needs. 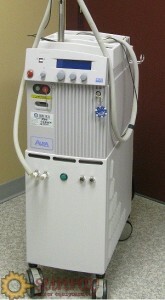 This refurbished Aura StarPulse Lasers is a dependable, durable, and user-friendly cosmetic laser equipment. Powerful and compact it fits easily in any office or clinic setting. Expand your treatment resources. A used Aura StarPulse delivers both continuous wave and the exclusive StarPulse technology, a pulse variable from 1 to 30 milliseconds. The Aura StarPulse Laser is easy to install, plug the unit into any standard 110-volt outlet with sufficient amperage and your equipment will be ready to treat your next patient. Naturally, we are always prepared to discuss all the models in our broad laser inventory. Our specialists are happy to discuss the particulars of this item. For further equipment details and a great, low price quote, please take a moment to fill in our contact form below. One of our highly knowledgeable representatives will be in touch quickly.